Until recently our business was called Fixit however there was a bunch of problems we faced with the whole brand and position we had settled on. You can read more about that here. This post is aimed to help any other founder when he or she is faced with the task. The first step involved a new name, after much searching- starting at instantdomainsearch.com to find a nice .com then onto IP Australia and beyond to check for trademarks and finally onto www.namechk.com to explore the available social media handles we settled on Conexie. New logo – fortunately we have a very good graphic designer out of India, this process took us a week and we were very happy with the outcome. We migrated from Zendesk’s help centre onto Intercom’s. 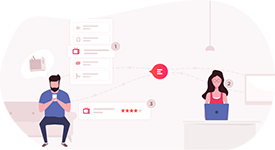 We can see the pros of both however our feeling is Intercom is a forward moving agile tech platform and it provides exactly what we needed with a simple user interface. New SSL certificate – we signed with GeoTrust in April who provided us with the original EV SSL (company name in the web browser) this gave us four subname.fixit.do’s. Fortunately GeoTrust was very accommodating and allowed us to change the domain while keeping the other up and running while we switched- all for no extra cost. Change all our emails to @conexie, this was made very easy as google’s G Suite co-creates an alias for the @fixit.do so it was business as usual straight after the change. We did also create a catch-all for any anomalies that slipped through to an @fixit.do email address. With all the above achieved we then reached-out to our mentors and advisors to seek their input. We knew we were heading in the right direction however we were keen to polish what we had once we had found the edges. We deliberately didn’t raise the topic of our rebrand until the later stage- this would have confused people and opened us up to advice we may not have been ready to receive.